– Everything would be hand made and hand stitched, and hence displaying a great level of attention and care to a specific product, versus mass produced assembly line clothing that the general public donned. So with that conveniently established, what does the modern day man do when looking for a bespoke suit? Clearly, finding the right balance of the right tailor, fit, fabric types and styles, designs and intricacies can be overwhelming for the experienced let alone the novice buyer. So we have decided to break down your first time buying experience into manageable chunks that will make your overall visit to your tailor a much more enjoyable one! 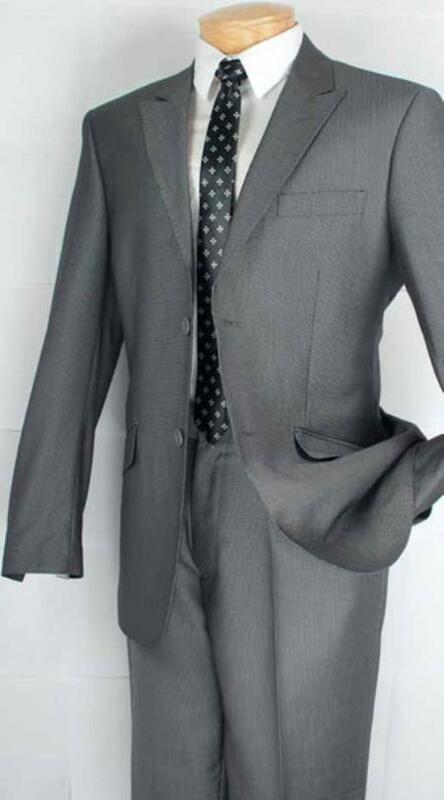 Single Breasted or Double Breasted Suits – These suits most commonly make the wearer look slimmer. On single breasted suits, a two or three button closure is standard, with more buttons being appropriate according to your height, but you should probably never get more than three. Four to six buttons are generally considered standard fare for double breasted suits. The trend for the last decade (I realize this isn’t much of a trend but more of a permanent shift!) has been towards single breasted suits, especially for the younger generation. It is generally more complimentary of slimmer men, and even to the extent that you are of broader stature, can look very appealing if carried in the right manner. Double breasted suits are classics but more resembling of the 70’and 80’s Wall Street heydays. Two or three piece – If you are looking to wear a vest for that special occasion, go for the three piece! 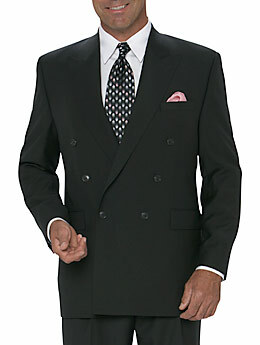 Otherwise, the standard business attire suit of two pieces (trousers and a jacket) is much more commonplace these days. Remember, there is nothing wrong with making heads turn at that cocktail party with your three piece suit. This is why bespoke is so much fun! You get to choose what you want to wear, how it will look, and exactly how it should fit. That’s an experience you couldn’t come within a mile of hitting at a traditional retail store! Single or Double Vent – Single vent suits are classic American, whereas double vent suits are considered classic English. Natural or Padded Shoulders – If your shoulders are naturally broad, you would generally opt for no padding, as you don’t want ‘reinforced’ shoulders. Narrower shoulders could potentially benefit from padded shoulders if you want to accentuate the coveted ‘V’ look that most men desire. Peaked or Notched Lapels (please see later posts for more details) – Notched lapels are standard fare for a single breasted suit, whereas peak labels are often construed as being more stylish. Peaked lapels tend to give the illusion of added height in addition to extra shoulder width, so keep that in mind! Whether it’s your first or umpteenth visit to your favorite bespoke tailor, you will more often than not be overwhelmed with choice. My advice is to first pick the type of fabrics that you are interested in. Design can be chosen later. When sifting through the myriad choices of fabrics available, be careful to really feel them to ensure that you are finding something that you feel comfortable with. Select the best choice of fabrics that you feel will cater to the occasion that you will be wearing them for. If it’s an interview, for example, a charcoal grey would like just right. You should have the opportunity to choose from any number of fabrics, including wool blends, silk or even cashmere. Try to choose the best fabric you can given your budget, so as to ensure a durable suit that gives you the best look that you desire! Working Button Holes / Functional Button Holes – Off the rack suits that have sleeve buttons are generally just there for aesthetic purposes. These buttons cannot be undone to create arm room. One of the hallmarks of a bespoke suit are working / functional button holes. Roll up that jacket sleeve to really glamorize your purchase at that wedding reception! Pants – Your trousers should fall straight from your waist with few wrinkles. The inseam of your pants should break slightly on the shoe, but excess fabric should not bunch up around the ankles. 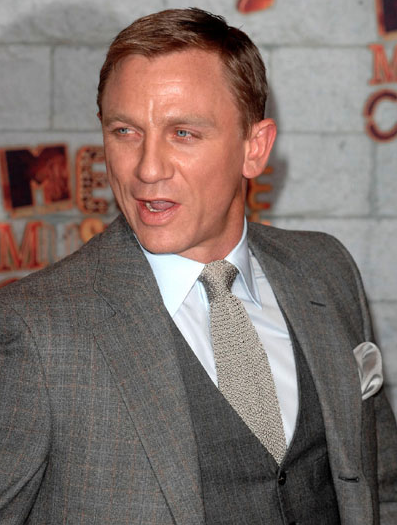 Daniel Craig always looks sharp, with that said I admire his choice of a three piece above! Yes he does look slick in a 3 piece!